Drawing upon the sciences of acoustics, linguistics, and physiology, D. Ralph Appelman advances a system of teaching voice based on the International Phonetic Alphabet. 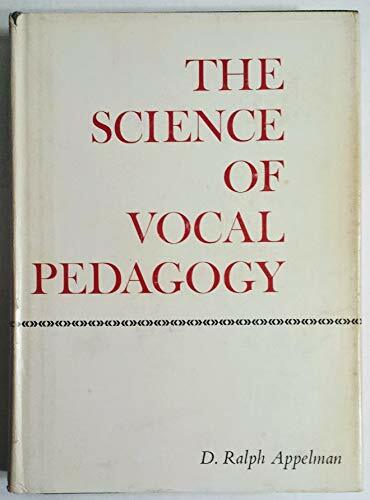 His premises are that vocal pedagogy requires an understanding of physiological and physical processes; that the singer and the voice teacher need pedagogical tools to link this scientific knowledge with the art of vocalization; that the word in the art song provides such a tool, for it conveys the primary meaning of the utterance; that the art song, therefore, demands intelligibility as well as beauty; and that if the art song is to attain the aesthetic level demanded by the music and the text, the singer must master a refined and orderly vocal system. Liberally illustrated with photographs, x-rays, spectrograms, palatograms, charts, drill materials, and drawings, this text develops the total process of disciplined vocal utterance, progressing from the physiological aspects of phonation to the elements of aesthetic interpretation and the art of combining the two in song.